Welcome to KAYSERAI CATTERY, a CFA and TICA registered cattery. 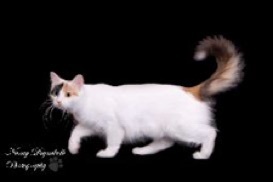 Our goal is to produce good quality Turkish Van kittens for showing, breeding, and as pets. 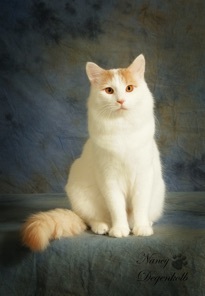 TURKISH VAN CATS are an ancient breed. Their history goes back to the mountainous LAKE VAN region of EASTERN TURKEY. Vans are medium in size, but sturdy and muscular. They have semi-long hair with s silky texture. The cat is WHITE except for a COLORED TAIL and COLOR on the HEAD. They can also have a few spots of color on the body. These unique markings are called the VAN PATTERN. They also come in the very rare and revered SOLID WHITE. Turkish Vans are LIVELY, INTELLIGENT, and INDEPENDENT. Vans make wonderful COMPANIONS and pets. They tend to BOND STRONGLY with one or two people in a family. 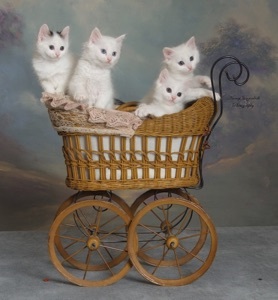 They remain active and playful well into old age. Many Vans are fond of WATER. This comes from their origins of catching fish in Lake Van. Owners of Turkish Vans must be careful of unsupervised access to water. They are well know for bathing toys in water and playing in dripping faucets.